Each month during the school year, students from our elementary schools are selected to receive the Superintendent’s Star Award for outstanding citizenship. As Eleanor Roosevelt stated, "People grow through experience if they meet life honestly and courageously. This is how character is built." 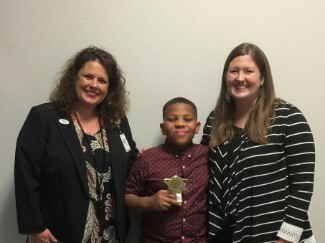 Monty Lofton has been chosen from Nancy Neal Elementary based on the virtues of outstanding character, citizenship, fairness, honesty, kindness, respect, responsibility and trustworthiness. Below is a picture of Mrs. Ferrell (Nancy Neal Elementary, Assistant Principal), Monty, and Mrs. Siegel, Monty's 4th grade teacher.